1st - St. Thérèse of the Child Jesus, Carmelite nun at Liseux, 1897. Her biography, The Story of a Soul was published after her death. In this it was shown that holiness is something all can obtain by being faithful in the doing of small things. - St. Remigius, Bp. & Apostle to the Franks, 533. Baptised Clovis, King of the Franks & c.3,000 subjects in 496. Formed dioceses, built churches & continued to baptise many to the Faith. 2nd - Guardian Angels' Day For centuries at Compline, Christians have commended their souls into the hands of God each night, and prayed for the holy angels to watch over them and kept them safe. ` - St. Thomas of Hereford, Bishop, 1282. After ordination in France returned to Oxford to lecture in Canon Law, where he became Chancellor in 1262. Was a friend to the poor and supported the barons against Henry III. Elected bishop of Hereford in 1275 and embarked on a cleansing programme in his diocese. Came into conflict with the A'bp of Cantaur, John Oeckham, infringing on local concerns. Was ex-communicated. Travelled to Rome where the Pope voided the ex-communication, but died on the return journey..
3rd - Hewald, the Black & Hewald the White, Priests & Missionaries c.695. Joined Willibrord in Frisia. Here they said Mass each day on a portable altar amongst the heathen until they were seized and killed and bodies thrown into the Rhine on this day. These were afterwards recovered by Pepin who enshrined them in the church of St. Cunibert, Cologne. - St. Gerard of Brogne, Abbot, 959. Founded an abbey on his family estate at Brogne. Despite his desire to live the hermit life, he was called upon to reform monasteries across nothern Europe. Died in his cell on this day. 4th - St. Francis of Assisi, Friar and Founder of the Friars Minor, 1226. Known as the loveliest of all saints through his intense identity with the sufferings of Christ and his love of all creation as illustrated in his many canticles. - St. Petronius, Bishop, c. 445. In early life visited the Holy Land. In 432 consecrated bishop of Bologna. In a monastery in this city erected seven connected chapels replicating the sacred sites of the Holy Land. 5th - St. Maurus (& Placid), Monk, 6thC. Entrusted by his father to Benedict to be educated and became a monk at Monte Cassino. In obedience to Benedict rescued the boy Placid from drowning by walking on the water. Adopted as the patron of the famous Benedictine abbey of Saint- Maur. 6th - St. Bruno, Teacher & Monk, 1101. After 18 years of lecturing at Rheims, he & 6 others established a house at La Chatreuse, based on the early desert hermit style of living in individual cells. Hence the founder of the Carthusian Order. - St. Faith, Martyr 3rdC. Jerome records her death at Agen in Gaul. A very popular saint and both Westminster Abbey and St. Paul's cathedral have chapels dedicated to her. - St. Nicetas of Constaninople, Religious, c.838. Renounced his life as a courtier to become a monk. Involved in the iconalistic dispute. When the emperor Leo V abolished icons, Nicetas fled Constaninople with an icon of Christ. Soldiers were sent to destroy the icon, and even though Nicetas begged them not to, all was to no avail. Spen his life as a refugee. - William Tyndale, Reformation Martyr and Priest, 1536. His life ambition was to translate the Bible from the Greek into English. Thwarted by the Church in England, settled in Hamburg. Before his arrest & death he had succeeded in translating most of it, much of which was incorporated into the Authorised Version. 7th - Our Lady of the Rosary. This celebrates the defeat of the Turks at the battle of Lepanto by Christian countries in 1571 in the Gulf of Patras. It was a very signicant victory, perhaps wrought by the prayers of Pius V and many other Catholics. - St. Justina of Padua, Virgin & Martyr, c. 300. A victim under the persecution of Maximian, but little is known of her life. In the 6thC a church was dedicated to her in Padua and a monastery was attached to which followed the Benedictine Rule. In the 16thC. the reformed Cassinese Congregation of St. Benedict's Order rebuilt her church lavishly. - St. Arthaud, Bishop, 1206. Entered the Carthusian order in Portes-en-Bugey. France. Was sent to other parts of France to found new foundations. As an old man he was chosen to be bishop of Beley, but soon returned to his monastic life. - St. Osyth, Virgin & Martyr, c.675. Daughter of a Mercian Prince, was forced into marriage with East Saxon King, Sighere. At the marriage banquet, a deer leaped past the window. Sighere gave chase. Osyth seized her chance and took refuge with two bishops. Her husband gave her land to found a convent of which she became abbess. When Danes raided the site Osyth resisted and was killed. 8th - St. Pelagius, Penitent, c.5th C. An actress by profession with all the vanity attached to it. Was converted, baptised and gave away all her worldly possessions and henceforth lived the life of a hermit. - St. Simeon 1st C. The devout man of Jerusalem who longed for the coming of the Messiah. Remembered on this day in the Roman Rite since the 9thC. - St.Keyne, Virgin, 6thC. Traditionally a daughter of Brycham, the Welsh patriarch. Although beautiful, she became a hermit at the foot of a mountain. On her deathbed, two angels exchanged her sackcloth robe with a fine dress. 9th - St.Denys & Companions, Bishop & Martyrs, c.250. Patron of France. Missionary from Italy to the Gauls. In Paris built a church on an island in the Seine. After their martrydom an abbey, dedicated to St. Denys, was built over their tombs. Has become the burial place of Fr. monarchs. - Robert Grosseteste, Bishop, Philosopher & Scientist, 1253. Bp.of Lincoln, largest diocese in England. Translated many theological works from the Greek & wrote his own commentaries. - St. Publia, Widow, c.370. After death of husband, turned her home into a community in Antioch. When Julian the Apostate heard the women singing Ps. 115 condemning idol worship, he ordered their silence to which they responded with Ps. 68 "Let God arise, let his enemies ber scattered." Women spared execution as Julian died soon after..
- Saints Cirilo Bertran, Marciano Jose, Inocencio de la Immaculada, & Companions, Martyrs, 1934. Brothers of the Christian School in turon, Spain captured by Revolutionaries in Spanish Civil War. Early on 9th Oct.. taken to the cemetry.where they were shot and thrown into a prerpared grave. - St. Sabinus. Hermit, 8thC. Spent most of his life as a hermit in the Prynees mountains, not far from Lourdes. Lived a very ascetic life. - St. Ghislain, Abbot. c.680. A hermit in the forest in Hainaut. On one occasion he lost his chasuble toa bear. Recovered it with the help of an eagle. Thereupon he founded a monastery where he retreived his chasuble. 10th - Paulinus, Bp, 644. 1st bishop of York, & built first church there in c. 627. Amongst 2nd gp. of monks sent by Gregory to England. As chaplain to the Christian princess Ethelburga accompanied her to Northumbria when she married King Edwin who soon converted. - Thomas Traherne, Priest & Poet, 1674. Private Chaplain to the Lord Keeper of the Seals of Charles II. His poetry, most of which has only recently been discovered, concentrates on celebration and glory of creation. 11th - Ethelburga, Abbess of Barking, 675. Bede relates in his Eccles. History of many miracles performed by this abbess. Was sister to St. Erconwald, bishop of London, who appointed her Abess of the double monastery. - St. Mary Soledad, Virgin & Religious, 1887. A founder member of the Handmaids of Mary, with a special devotion to Our Lady of Sorrows. Despite setbacks, the congregation prospered and spread through Spain during her lifetime. - St. Bruno the Great, Bishop. 965. Son of the German Emperor,Henry. At an early ager consecrated archbishop of Cologne. A good pastor who frequent his diocese often. Encouraged his clergy to live to the ideals of monasticism. 12th - St. Wilfrid, Bp. 709. Attended the famous Synod of Whitby 664, and mainly through his persuasion the English Church came to follow customs of the Roman Church rather than the Celtic. Abbot of Benedictine community at Ripon. For a while bishop of York, but ended his life as bishop of Hexham. 13th - Edward the Confessor, King, 1066. Of great piety. Responsible for building the church of St. Peter, Westminster, commonly known as Westminster Abbey where he is buried. - Edith Cavell, Nurse, 1915. During W.W. I worked with the Red Cross. Whilst smuggling British soldiers from Belgium into Holland arrested, & executed by a firing squad. Went to her death bravely and forgiving her executors. 14th - Callistus I, Pope & Martyr, 222. A most controversial figure. Born a slave, in life was a convict, worked in the mines in Sardina. When he became Pope in 217 had a short and controversial reign. Opposed by the anti-pope Hippolytus over what was regard as his laxity towards the lapsed when he admitted the murderers and adulterers to Communion after their repentance. Died in a popular riot caused by the schism. - St. Burchard, Bishop, 754. Left England to work as a missionary in Germany to help Boniface who consecrated him as bp. for the new diocese of Wurzburg. During his 40 years he set an example of humility and charity. Founded the abbey of St, Andrew. Spent final years living the monastic life. - St. Menehould, Virgin, 6th C. Youngest of 7 daughters who all became saints. Looked after her parents and the sick. After her parents death retired to a hermitage in Bienville. 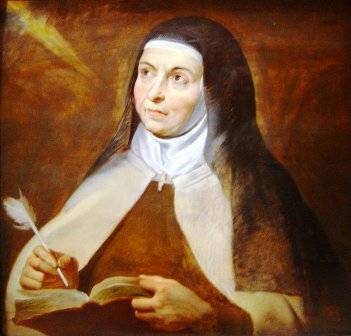 15th - St. Teresa of Avila, Religious & Doctor, 1582. Reformed the Carmelite rule. Her own spiritual journey and mystical experiences are well documented in her writings, The Way of Perfection and The Interior Castle. - St. Cannatus, Bishop, c.487. A hermit, near Marseilles. Appointed bishop of Marseelles, an office he accepted with great reluctancy. A good shepherd who protected his flock from heresy. - St. Bruno of Querfurt, Bishop & Martyr, 1009. A monk and hermit befeore being consecrated bishop to be a missionary which took him to the Hungarians, Ruthenians & Prussians. Amongst these people he and his 18 companions were martyred. - St. Leonard of Vandoeuvre, Abbot, c.570. Founded a hermitage which became a monastery as his followers increased. Complaints were made to Frankisk King Clotaire 1 who visited the monastery for himself.Was so impressed with its holiness, he became a supporter of Vandoeuvre. 16th - St. Gall, Monk & Hermit, c.630. Accompanied Columbanus to Gaul where they founded monasteries at Annegray & Luxeil. Exiled went to Tuggen by Lake Zurich where they were given land for a hermitage. Gall one of the pioneers of Christianity in Switzerland. The Benedictine abbey bearing his name was not built by him but it houses ones of the great libraries in the world. - St. Hedwig, Duchess of Silesia, Nun, 1243. Founded 1st convent in Silesia at Trebnitz, and after she and her husband agreed to live in continence, lived nearby. Miracles and prophecies attributed to her, as well as being a peacemaker in her own family. - Latimer, Ridley & Cranmer, Reformation Martyrs. Burned outside Oxford - L & R. in 1555 & C. in 56 for the Reformed faith after a return to Papal control in England under Mary 1. - St. Lull, Bishop, 786. Joined Boniface in missionary work in Germany. Consecrated bp. of Mainz 752. Founded monasteries including one at Hersfeld to where he retired and died. - St. Moulin, Bishop, 683. A monk in Luxeuil who went on to establish monastery in St. Omer. In 660 consecrated bishop of Noyon and Tournai. - St. Bertrand, Bishop, 1123. Although a bishop of Comminges, lived according to the Rule of Augustine. Tried to carry out reform amongst his clergy who were not very receptive. - Blessed Urulines of Valenciennes, Religious & Martyrs, 1794.. Jacobins charged he nuns for illegally re-opning thier convent. Guillotined on this day. - St. Nothelm, Bishop, c.740.. Archbishop of Cantaur who travelled to Rome to research documents in Vatican archives re Augustine's work. Returned to England with them and were used by Bede in his famous work, Ecclesiastical History. - St. Mamelchtina, Martyr, c.343. A pagan priestess in Iran. After a terrible dream her Christian sister had her baptised. On hearing this the pagans were outraged and seized her still in white baprismal dress and stoned her. 18th - ST. LUKE, Evangelist. Author of the 3rd Gospel and Acts. The latter unveils the birth of the Church at Pentecost and how the Holy Spirit guided the Apostles to preach the gospel to all. Tradition states that he died in Boeotia, 84 years old. 19th - St. Frideswide, Patron saint of Oxford, 727. Abbess of a double monastery where Christ Church Cathedral. Her shrine in the cathedral is a constant reminder that the university grew up around her monastery. - Henry Martyn, Priest & Missionary, 1812. Spent most of his life in India and later in Persia. Responsible for N.T. translation into Hindustani, Persian & Arabic. 20th - Maria Boscardin, Religious & Nurse, 1922. She resembled St. Theresa of Lisieux, whose spiritual teaching she followed, in having good judgment, a strong will and unobstrusive perseverance in humdrum duties. Nursed soldiers during W.W. I. After the War returned to hospital at Treviso where she worked with children in the isolation wards. After her death her tomb at Vicenza has been a centre of pilgrimage and miracles. - St. Paul of the Cross, Religious, 1775. Zealous missionary, founded homes for the poor and sick. Lived an austere life with harsh penances. - St. Acca, Bishop, 740. Abbot of St. Andrew's abbey, Hexham, and served as an assistant to Bishop Wilfred until his death. Succeeded him as bishop of Hexham. Introduced Gregorian chant, and began collection of numerous biographies of the saints and other religious works. 22nd - St. Donatus, Monk & Bishop, 876. On returning from pilgrimage to Rome arrived in Fiesole when a new bishop was being chosen, and was acclaimed as he entered the cathedral. A scholar and teacher. Wrote a life of St. Brigid, in praise of his native Ireland and founded a hospice for Irish pilgrims. - SS. Philip of Heraclea, Hermes & Severus, Martyrs, 304. Under Diocletian's persecution, churches were closed, but Philip the bishop of Heraclea continued to hold services outside . He, Severus, his priest & Hermes , his deacon were arrested and burned to reath after being buried upto their knees. - St. Cordula, Virgin & Martyr, 451. One of the companions accompanying St. Ursula who were all martyred by the Huns in Cologne. 23rd - St. John of Capistrano, Franciscan, 1456. A renowned preacher, even against the Turks after the fall of Constantinople in 1453. Reformed and reorganised the Franciscan Observant Friars. Instrumental in the defeat of the Infidel at the battle of Belgrade, 1456, which saved Europe from these heathens. - St. Romanus, Bishop, c. 640. Bishop of Rouen. Credited with preventing a flooding of Rouen by his prayers as he held a crucifix. For centuries afterwards this was obseved aas an annual custom. 24th - St. Anthony of Claret, Jesuit & Bishop, 1870. Founded the congregation of Missionary Sons of the Immaculate Heart of Mary, known as the Claretian congregation. Preached tirelessly in Catalonia before being sent to Cuba as archbishop. Encountered much opposition & returned to Spain to be Confessor to Queen Isabella II. At the revolution of 1868 both went into exile. A special feature of his ministry was his promotion of the printed as well as the spoken. - St. Proclus of Constaninople, Bishop, 446. Disciple of John Chrysostom, defended the orthodox faith against Nestorianism; Credited with composing the Trisagion. Gave many homilies on Theotokos. - St. Senoch, Abbot, c.376. Although tempted with pride in early life as a hermit, over came this sin. Became abbot of the monastery at Senoch..
25th - SS. Crispin & Crispinian, Martyrs, c. 287. The commemoration of this day was immortalised by Henry V when the English army won miraculously the battle of Agincourt on their day in 1415. The saints were shoemakers, and reputedly they preached the faith where they exercised their trade. Martyred under the Diocletian persecution. - SS. Chrysanthus & Daria, Martyrs, 3rdC. These two after marriage came to Rome where they consecrated their lives to God and doing good works, which attraced the attention of pagans. Arrested, tortured and buried alive. 26th - Alfred the Great, King of Wessex & Scholar, 899. Stemmed the expansion of Danish territory in Briton. Gave great stability to both Church & State. A pious king who daily attended Mass, founded religious houses, and had translated into the vernacular many important writings. -St. Cedd, Bp., 662. Belonged to the famous monastery at Lindisfarne. Missionary to kingdoms of Mercia and Essex. Consecrated to become bp. to the East Saxons. Built churches, founded 2 monasteries in Essex. Died after attending to the synod of Whitby, 664. - St. Eata, Bp. 680. St. Bede described him as "a meek and simple man". Trained under Aidan, and consecrated bp. of Hexham, & subsequently Abbot of Lindisfarne. 27th - St. Odran of Iona, Monk, 563. One of Columba's first companions on Iona who diedshortly after arrival. Columba describes his vision of Odran's soul ascending to heaven being fought over by angels and devils. The cemetery at Iona is named in his memory. 28th - SS. Simon & Jude, Apostles. Commemorated together on this day as a church in Rome was dedicated in memory of these two in the 7thC. Simon, known as the Zealot, probably belonged to a nationalistic movement. Jude, also Thaddaeus, is probably the author of the Letter of Jude. 29th -St. Colman of Kilmacduagh, Monk & Bishop, 632. First bp. of Kilmacduagh, but lived very frugally. Had a special affinity with animals. - James Hannington, Bp & M. 1885. Missionary in Africa & consecrated bp. for Eastern Equatorial Africa. He and his companions were butchered to death on entering into Uganda. - St. Abraham of Rostov, Abbot 12thC. On is conversion to Christianity became a monk and preached the Gospel to pagans of Rostov. Built two churches and a monastery where he became abbot. - St. Ethelfleda, Religious, c.1030. Raised by the nuns of Romsey Abbey, and she herself became a nun there. Imposed the penance of reciting the psalms in ther middle of the night in icy water. Became abbess in 996. 30th - St. Marcellus the Centurion, Martyr, 298. Whilst in service publicly confessed his allegiance to Christ. 'I am a soldier of Jesus Christ, the eternal king. From now on I cease to serve your emperors and I despise the worship of your gods of wood and stone, for they are deaf and dumb images." On this day he was sentenced to death by the sword. - St. Alphonsus Rodriguez, Religious, 1617. After his wide and children died enteresd the Jesuits. Lived as a lay-brother, a porter at the Jesuit College on Majorca. Man of prayer and wisdom. 31st - St. Wolfgang of Regensburg, Monk & Bishop, 994. Monk at Einsiedeln in charge of the school. In 972 appointed bishop of Regensburg. Began with reform of the clergy. Remained at heart a monk and was noted for his prayer life and preaching. Has remained a popular saint with many still venerating his relics at Regensburg. - St. Foilan, Abbot, c.655. With his two brothers travelled from Ireland to preach the gospel in England. Founded a monastery near Yarmouth as their base. Left to do missionary work in Gaul and as a result their English monasatery pillged by Mercians. Fooilan later murdered in an ambush by robbers and buried in another monastery founded by him at Fosses. - Martin Luther, Monk & Reformer, 1546. Professor of theology at university of Wittenberg. Wrestled for years about his own unworthiness until a new understanding of Paul's words, "made righteous with God" changed his life and much of northern Europe's teaching on Christianity. If we are made righteous through Christ, then indulgences are unnecessary. Hence his famous thesis against these, which he nailed to the door of Wittenberg castle in 1517, and put into motion his break with the Church of Rome. - Vigil of All Saints Day - preparation for this great feast in prayer and meditation. 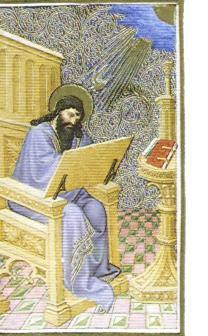 ST.LUKE'S GOSPEL IS OFTEN DESCRIBED AS THE MOST BEAUTIFUL BOOK WRITTEN. ONE ONLY HAS TO READ THE FIRST TWO CHAPTERS TO KNOW WHY. 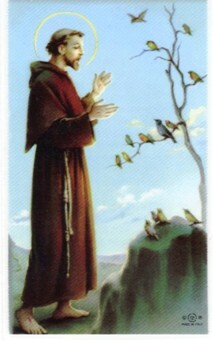 ST.FRANCIS IS OFTEN DESCRIBED AS THE MOST LOVABLE OF ALL THE SAINTS, AND THE MOST CHRIST-LIKE. HE RECEIVED THE STIGMATA AND CERTAINLY SHOWED US HOW TO LOVE IN PEACE AND POVERTY IN ORDER TO FREE THE SOUL.